Copyright © 2006 by Aletha Solter. All rights reserved. No part of this article may be reproduced or transmitted in any form or by any means, electronic or mechanical (including copying to other web sites, and including translations), without written permission from Aletha Solter and Da Capo Press. Teenagers frequently complain that their parents don't listen and don't understand. This lack of good communication can lead to a feeling of disconnection from parents, which can put teens at risk for using drugs as a way of coping with problems. Teens who have good communication with their parents are less likely to use drugs. Good listening involves reflecting back your teen's feelings so he feels fully heard. This is called "active listening" or "reflective listening." Parents sometimes find it difficult to listen well to their teenage children. The four major mistakes are advising, blaming, consoling, and rescuing. The example below illustrates these four mistakes. It is followed by an example of helpful listening, which is an actual transcript of a conversation between a parent and teenager. David (age 15, angry): I hate my basketball coach! He never lets me play. Only the best kids get to play in the games. All I do is sit on the sidelines. Advising: You should tell your coach how you feel. You've got to learn to speak up for yourself. Blaming: What do you expect? Some of those kids have been playing basketball since they were seven years old. You never wanted to join a team when you were younger. Consoling: I'm sure you'll improve with practice. Be patient, it takes time. Your coach just hasn't seen your potential yet. Rescuing: I'll have a talk with your coach. It doesn't sound fair to me. That's no way to treat an eager young basketball player like you. Mother: It sounds like you're pretty angry at that coach, and you're feeling left out. David: Yeah! I thought basketball would be fun. All they're interested in is winning. Mother: You were looking forward to being on a real team, and now you're disappointed because it's so competitive. David: Maybe team sports isn't for me. I like basketball, but I guess I'm just not that competitive. I prefer to shoot baskets with my friends on the weekend. I'll stay on the team this year, but next year I think I'll just play basketball with my friends. Realize that your teen may need more than one conversation before reaching a resolution. If your teen wants to talk late at night, be sure to schedule another time to continue the conversation if you are too tired. If your teen cries, it's a sign that he feels emotionally safe with you. Continue to listen without stopping the tears. It is never too late to improve your listening skills and repair your relationship with your teen. He will appreciate your efforts and gradually begin to share more of his problems and feelings with you. Aware Parenting is a philosophy of child-rearing that has the potential to change the world. Based on cutting-edge research and insights in child development, Aware Parenting questions most traditional assumptions about raising children, and proposes a new approach that can profoundly shift a parent's relationship with his or her child. 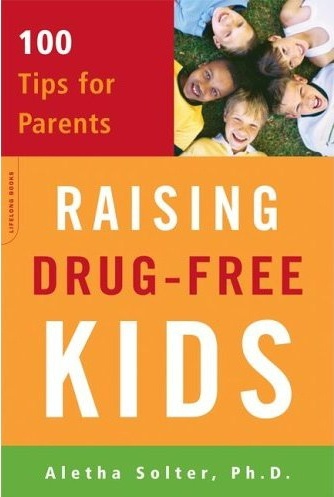 Parents who follow this approach raise children who are bright, compassionate, competent, non-violent, and drug free. For more information about non-punitive discipline with teenagers, see Aletha Solter's book, Raising Drug-Free Kids. This page was last updated on February 21, 2018. Copyright © 2006 to 2018 by Aletha Solter. All rights reserved. No part of this article may be reproduced or transmitted in any form or by any means, electronic or mechanical (including copying to other web sites, and including translations), without written permission from Aletha Solter and Da Capo Press.